FOOD WASTE – WE’RE all guilty of it. In fact, Irish households throw away on average between €400 and €1000 worth of food per year, with 60% of this classified as avoidable food waste. But how do we avoid it? Some easy things to start with are making lists before you shop (and sticking to it), shopping more frequently and buying less and generally trying to be more organised in our meal planning. But day to day there are plenty of foods that deserve a new lease of life instead of ending up in the compost bin. Here are six ways to make the most of your leftovers. 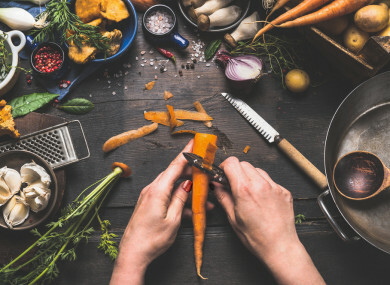 First things first, do you need to peel your vegetable? Potatoes can be washed and cooked skin on, mushrooms just need a quick brush or wipe, carrots and parsnips roast well with skins on. You’re keeping valuable nutrients in your meal and making your life a bit easier by leaving skins on. And when you do peel, skin or trim your vegetables don’t throw any of this out! Keep a freezer bag on the go, to stash these valuable offcuts. Once your bag is full, you’ve got the makings of lovely homemade vegetable stock. Simply pop them in a big pot, cover with water – add in an onion, carrot and celery, chopped chunky, a few peppercorns and bay leaf. Cover with cold water, bring to the boil, reduce the heat and simmer for 1 to 2 hours or more and hey presto, you’ve got homemade stock. Drain the vegetables (now you can compost them) and once the stock is cooled, divide it into containers and freeze it in small batches to keep handy for making soups, sauces, risottos and stews. Yes, you read that correctly, the water in your can of chickpeas is having a bit of a moment. Referred to as aquafaba (bean water) it has become widely used an egg replacer and has become the vegan ingredient du jour. Basically, the starch from the chickpeas seeps into the water giving it a viscous quality and when whipped it can hold air and so turns white and foamy just like eggs. It can be used for all manner of both vegan and non-vegan recipes and is great for meringues, pavlova, Yorkshire puddings, mousses and even in cocktails. You can freeze aquafaba until you need it or it should be good in the fridge for up to one week. A general conversion is three tablespoons of the liquid should replace one egg, but it does differ depending on what you’re doing with it. Have fun experimenting! This should be a no-brainer especially if you’re a toast eater. Keep your bread in the freezer from the start – just make sure it’s sliced and toast as needed. That way you shouldn’t waste a slice. I’m always surprised by how many people throw away the ends and heels of bread and then will buy bread crumbs for recipes! If you don’t like eating the heels, chop them up and freeze. When a recipe calls for breadcrumbs simply take them from the freezer, leave to thaw a little and then you can grate the bread in crumbs with a box grater or pop them in a strong food processor and chop into crumbs. Next time a recipe calls for a dash of wine or your sauce needs a bit of a kick you can simply pop to the freezer and use your pre-portioned ‘dashes’ of wine, no need to open a new bottle. We have great intentions when shopping to stock up on fruit for snacking but how often do you end up throwing some (or most) of it out? Time to put an end to this, with help from your freezer again. Over ripe bananas should be peeled, chopped up and frozen. They make for an excellent smoothie base and then there’s no need for ice. Go one more organised step further and puree your overripe fruit before you freeze it, this works for every fruit and you can mix them together. Cut away any soft or spoiled pieces, blend it all together and then freeze it in ice cube trays. You’ll have a lovely stash of fruit ready for smoothies, shakes or handy dessert sauce. Along with salad bags, herbs often seem to end up a bit forgotten after one use, but no more. Firstly take your herbs from the packets and store them in a damp piece of kitchen roll in the fridge – you’ll get a little longer out of them. When you do put them to use start keeping your stalks from hard herbs like rosemary and thyme. These can be added to your freezer stock bag along with your vegetable peels. They also work great as a flavouring for vinegar or oil, simply add your stalks into a plain vinegar or oil and leave it to infuse over time. Parsley stalks are delicious and shouldn’t be discarded – I’ll often use them chopped up in salads or they are great added to a homemade juice and packed full of nutrients too. If you find yourself with a lot of herbs left over you can chop them up and freeze them, again into the ice cube trays and they are great for adding into sauces and stews. When you have something like basil or rosemary, these can work great chopped up and frozen in ice cubes and brought out for jazzing up your water or gin and tonics, they look great in a drink. So there you have it. Think a bit before you throw stuff out and make plenty of space in the freezer. Probably a good idea to get some extra ice cube trays too. Email “6 everyday leftovers you really shouldn't be throwing away - and how to put them to work”. Feedback on “6 everyday leftovers you really shouldn't be throwing away - and how to put them to work”.